Cross-Arm Strap wraps around I-beams and other structures. 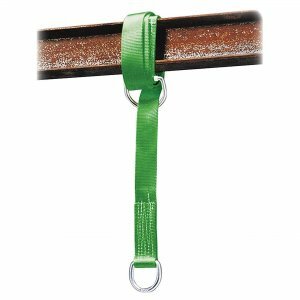 Strap attaches with a 2" (50mm) D-ring that slips through a 3" (76mm) D-ring to form a secure attachment point for lanyards and other connecting devices. 2" webbing is made of polyester. D-ring is made of steel. Another component includes six-cord bonded, three-strand polyester thread. Load capacity is 400 lb. (181.4kg).